Turning 9 years old is great. When you give a 9-year-old birthday boy or girl 9th birthday wishes with the whole nine yards, like the 9th birthday messages here, you can make his or her birthday even greater. What's the whole nine yards? 9th birthday greetings with a little bit of everything in them: humor, sentimentality, inspiration, joy, whatever it takes to make the 9th birthdays of kids everywhere super special. To pick the right birthday message for the 9-year-old birthday girl or boy in your life, check out Message Guy Tip #91 (just below) before you look at all the different greetings I've written here. This way, you're sure to find a winner of a birthday wish. ... you should choose birthday greetings that are halfway between childish and adolescent. Why the change in maturity level? Well, most 9 year olds have entered the world of "tweeners" (primarily children aged 9 to 12 who fall somewhere between "little kid" and "teenager"), reaching a new emotional and social plateau in the process. In other words, the 9th birthday wishes you select should be less babyish than the kind you've used in the past, showing the 9-year-old birthday boy or girl that you applaud (and support) their emotional and social development. In this respect, all the 9th birthday wishes on this page will be perfect. Wishing you a 9th birthday with the whole nine yards...pizza, cake, ice cream, balloons and lots of friends to share all the food and fun. Give us your BIG birthday smile and let’s have fun! You’re now 9 and this doesn't happen all the time! Happy 9th birthday! Happy 9th birthday! Hope you have a wonderfully special day and year on Cloud 9 years old! 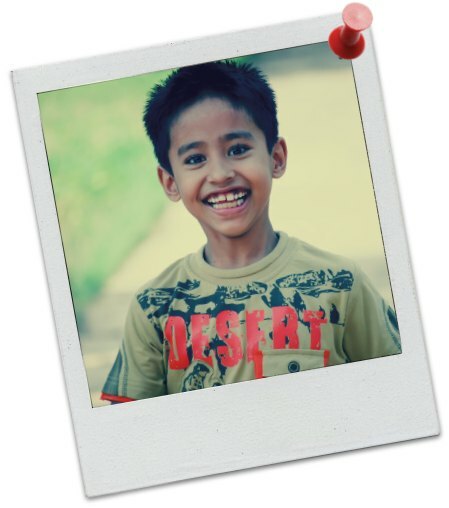 By using the "headstand" analogy, this birthday message lets the 9-year-old birthday boy or girl look at age in a different way and, ultimately, shows that age is only a number. 9 is 6 turned upside down! Whenever you feel old, do a headstand and turn everything upside down, even your age! Happy 9th birthday! 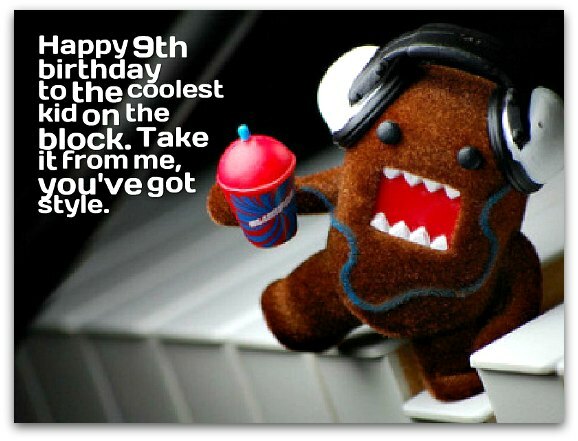 Turning 9 makes you so much cooler — at least nine times cooler! Happy 9th birthday! When you turn NINE, you're Nifty, Intelligent, Nice and Extraordinary. That’s so you. Happy 9th birthday! Happy 9th birthday! 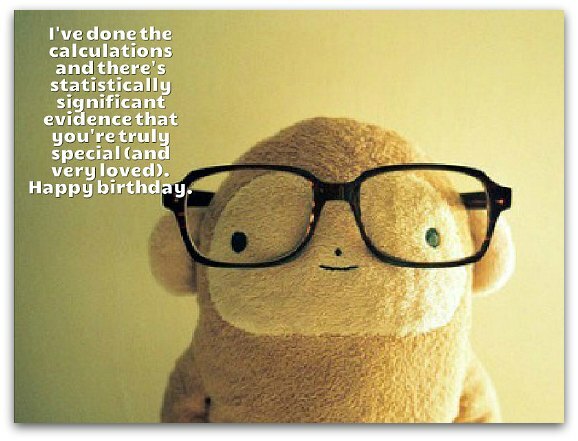 This year, you have nine candles on your birthday cake, so you have nine birthday wishes! Hope all of them come true before you blow out the last candle. 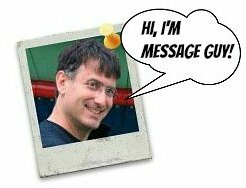 Want to see even more messages? Happy 9th birthday! May you always find joy in the little things life has to offer, the way you do now. Hey, this is your last single-digit birthday. You are getting so grown up — not only in age, but also in the way you act. I'm so proud of you. Happy 9th birthday! Happy 9th birthday! You're a better BFF than the best friend I ever imagined. Thanks for being mine! Happy 9th birthday! I would like to be the first to congratulate the leader of our country...in the year 2050! You'll definitely get my vote. Happy 9th birthday! May you always find joy in the little things life has to offer...the way you do now. May you always feel free to rock your own style, because that's what makes you (and everybody who truly loves you) happy. Happy 9th birthday! May you always have the amazing courage you possess today to face tomorrow's fears. Happy 9th birthday! Now you're old enough to do chores and be paid for it. Just kidding — you'll be doing it for free. Happy 9th birthday, my precious 9 year old. I'm incredibly proud of the way you smile, laugh, giggle, sing, hum, hug, share and love.